For 35 years Formland has been a design community for the entire industry. Every sector on the trade fair states a community, where exhibitors and visitors share a common passion for design and interior. Next fair is Formland Autumn 2019 15 – 18 August 2019. 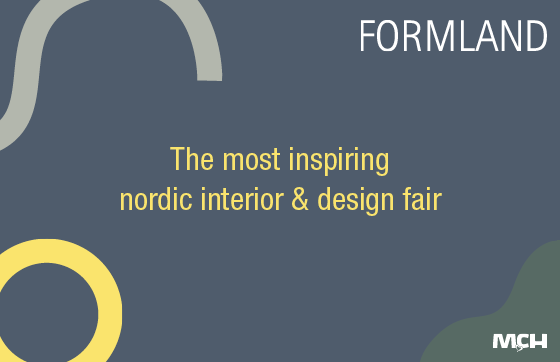 Why you should exhibit at Formland and become a part of Scandinavia's most inspiring design fair. Get an overview of the visitor types at Formland at the analysis below. Get a non-binding proposition from our sales team and become a part of Formland. Read more about our competitive prices - when purchasing a stand at Formland a wide range of services are included. Plan your trip to Formland. Get to the fair with our special flight from CPH & book hotel in Herning. Get access to your sketch plan, update your company profile and read practical info. Login is sent in a separate email. See all the delicious places to eat, bars, entertainment etc. which you can experience during your fair in Herning. Entrepreneurship is the focal point at our CREATORS COMMUNITY area at the Spring fair.